The Old Foodie: From Digby's Closet. Sir Kenelm Digby was born on this day in 1603. 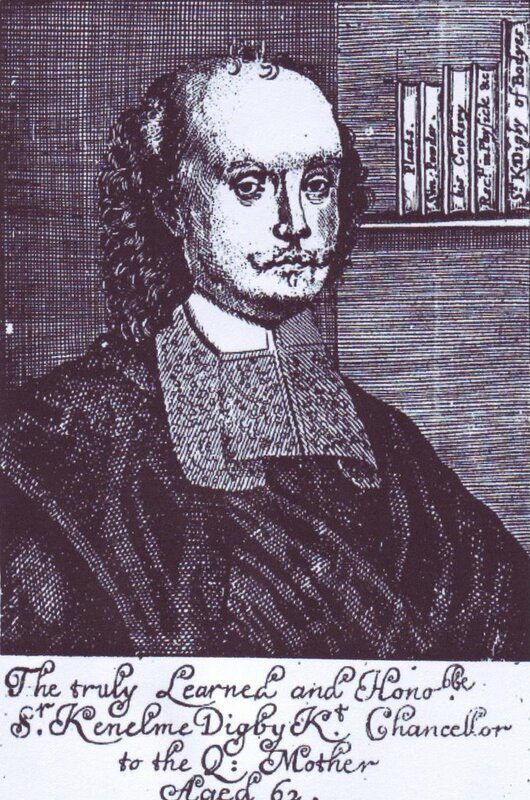 The naval commander, herbalist, amateur scientist, and privateer is best known for his collection of recipes published posthumously in 1669, with the grand title of ‘The Closet of the Eminently Learned Sir Kenelme Digbie Kt Opened: Whereby is Discovered Several ways for making of Metheglin, Sider, Cherry-Wine, &c. together with Excellent Directions for Cookery: As also for Preserving, Conserving, Candying, &c.’. It was essentially a still-room book - a book of herbal and medicinal lore, with some culinary recipes and many for fermented drinks, especially those based on honey such as mead and metheglin. One of its charms is the method of timing of recipes, such as when making tea: ‘The hot water is to remain upon it no longer than whiles you can say the The Misere Psalm very leisurely’, which would be about right as the Misere (Psalm 50), recited very slowly, takes 2 ½ - 3 minutes. He had a tendency to celebrity name-dropping too, with recipe titles such as “Hydromel as I Made It Weak For the Queen Mother”, a delight she must have shared, as he modestly proclaims that is was “was exceedingly liked by everybody”. Take one Measure of honey, and dissolve it in four of water, beating it long up and down with clean Woodden ladels. The next day boil it gently, scumming it all the while till no more scum riseth; and if you will clarifie the Liquor with a few beaten whites of Eggs, it will be the clearer. The rule of its being boiled enough is, when it yieldeth not more scum, and beareth an Egge, so that the breadth of a groat is out of the water. Then pour it out of the Kettle into wooden vessels, and let it remain there till it be almost cold. Then Tun it into a vessel, where Sack hath been. Alcohol is necessary for a man so that he can have a good opinion of himself, undisturbed by the facts. Peter Dunne Finley. Love the mead recipe - but what does this mean "so that the breadth of a groat is out of the water" and "where sack has been" does that mean where sherry has been? Hello Miss Eagle, nice to hear from you - I've just been over to visit you at your blog! The instructions about the egg mean that the solution has to be so strong that an egg will float in it, mostly submerged, with only a little bit of the egg (the area of a groat, which was a small coin - maybe our 5cent size?) still appearing above the water. And you are right about the sack - he is suggesting reusing a sherry cask. Are you going to make it?? That recipe isn't all that different from the one I used last weekend, though I tossed in a quart of light malt just to vary the flavor a little. I used Irish Moss instead of eggs as my clarifying agent. Nevertheless, I bet the recipe you posted would make a pretty good batch!